The apartment is part of a small block with 18 apartments in total. It has a double bedroom and a twin bedded bedroom, bathroom, kitchen and lounge/diner and large balcony. Air conditioning and heating newly installed to meet with new government regulations. Shared rooftop terrace and swimming pool. Convenient for restaurants and beaches. 5 mins walk to beach and town centre. 4 sun loungers are provided for exclusive use of tenants. There are wonderful views of beach and mountains from the terrace. We bought this property to use as a holiday home and to rent out. It is in the oldest street in the town and was used by the fishermen to access the beach. It is within walking distance of several beaches and the town, so it is not necessary to hire a car. Modern fitted Bathroom with large walk-in shower, wc, and basin. Skiing is available in Granada which is about a 2 hour drive away. There are several golf courses within half an hour drive from the apartment. If you are a keen walker there are several walking trails in the mountains behind the town. We enjoyed staying in this apartment. It was spacious, comfortable and contained all we needed. 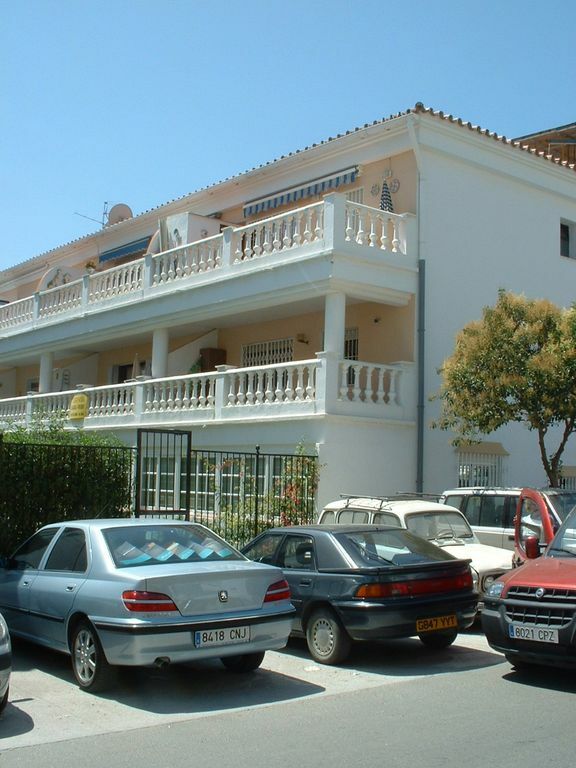 It is located 10 mins easy walk from Nerja centre whuch has all the facilities you could want. We wouldn’t hesitate to recommend the apartment. Nerja is a splendid small town in which to enjoy a restful holiday. The flat was really well set up and had a nice balcony. The air con worked very well, the swimming pool was perfect for wallowing on hot afternoons and the deck chairs were clean and solid. Our daughter found her single bed "very comfy" (tho I personally found it a little soft but that's just me!) and the double was fairly firm but not hard. The shower isn't very strong. The whole flat was clean and linen was replaced after 7 days. There were mats and an umbrella for the beach but they are slightly down-at-heel. It was a nice touch though. The kitchen had most things you would need. A note for coffee drinkers - they have a percolator (which we didn't try out) and a stove top espresso maker which we did use. The hob heats up very quickly. The only down side at all was that the big road had a lot of noise in the night as it was near a large car park. Bring ear plugs and all will be well. this apartment was perfect for us. We enjoyed being close to the centre and the beaches, but it was quiet and felt safe. It was exactly as described on the website, clean and well maintained. We managed to get free on street parking every day, and used the WIFI in the nearby cafes. Air-conditioning was very effective and great it was included in the price. Although the pool was small, it was enough for a short swim and to cool off- views from roof terrace were lovely. We have been going on holiday to Nerja since 1998 most years. For the last number of years we have been staying in Capistrano Village which is excellent but not central. It was great to stay at 99 Carabeo with everything on our doorstep with regard to restaurants and supermarkets etc. Now in our 60s we did not miss the evening trek back up the hill to Capistrano. Really good service from the owner iro keys and directions. We would book again. If you are a keen walker there are several walking trails in the mountains behind the town. The apartment is very conveniently located only 5 minutes walk from the main beach and town centre. The beach has a range of restaurants, childrens play areas, water sports, showers, toilets and lifeguards. Sunbeds and parasols available to hire. Malaga airport is about 40 miles away and can be reached in about 45 minutes by motorway. A local bus service runs from the airport to Malaga with a conecting bus service to Nerja, this will take approx 2 to 2.30 hours, however we recommend a car or taxi for transfer. A car is not essential at the apartment as everything is within walking distance. Places to visit include Granada, Ronda, Mijas, Frigliana and Nerja caves. There are local tour companies running trips to the above and other places. With a hire car it is possible to take a day trip inland to visit the mountains and lakes and see the real Spain! Booking Notes: Please check availability calender and prices. If your required dates are available please e-mail dates required and we will confirm the availability and price. 50% deposit required at time of booking and balance due 8 weeks before departure. Minimum 1 week bookings in July and August and 5 days at any other times. 20% Discount for long lets of 6 weeks and over in winter. Price on application. Changeover Day: Change over dates are flexible all year expect in late July and August when we only except weekend changeovers. Time of arrival is 3pm and departure is 10am except by prior agreement.